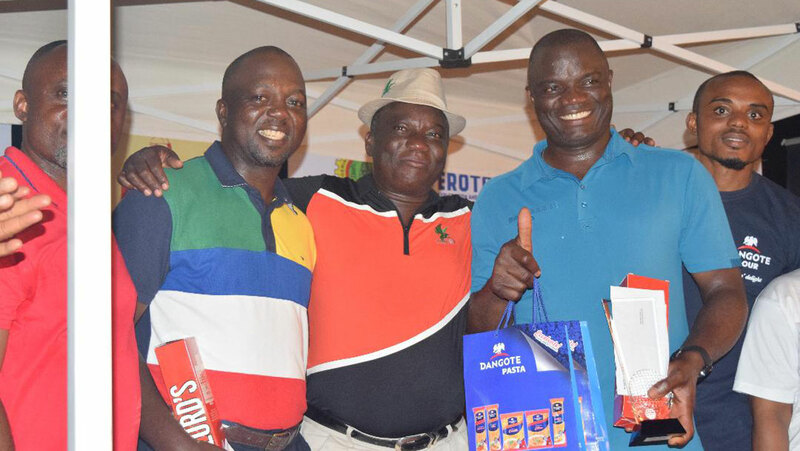 The champions: Julius Akinwumi Fadairo (left), International Pairs representative in Nigeria, Remi Olukoya and Bayo Alli at the prize presentation after the national finals of the International Pairs at the Uyo Golf Resort…at the weekend. Julius Akinwumi Fadairo of IBB International Golf and Country Club, Abuja and Adebayo Abdul-Semiu Alli of the Golf Section of Ikoyi Club 1938 will fly Nigeria’s flag at the International Pars world finals scheduled for Portugal next month. The pair at the weekend beat a packed field of stars at the Ibom Golf Resort to win the national finals of the 2018 International Pairs competition, which prize is the coveted ticket to the world finals.They grossed a total of 115-stableford points, beating their closest rivals, the team of Uwem Udoh and Usenobong Akpabio by four points. Coming in the third position were Abuja based Denis Osubu and Chris Osarunwense, who grossed 106-stableford points, while Okey Igwe and Jumai Abdulahi berthed in the fourth position. Northern qualifier champions, K.K Yusuf and Joey Obue completed the top-five on the winners’ chart. For their effort, the winners would be given an all-expense paid trip to the world finals of International Pairs in Portugal in November.Speaking shortly after being declared the winner, the team of Alli and Fadairo said they would strive to represent Nigeria well in Portugal. Satisfied with the end result, International Pairs representative in Nigeria, Remi Olukoya, who is also the Chief Executive Officer of Falcon Golf Development Company, thanked all the participants especially the sponsors, including The Paradise Abuja, Eroton E & P, Dangote Flour Mills, GTi Capital, Spar, Grand Oaks, 7up & Coca Cola for their support.